When VA-34 was established, it adopted the insignia and Blue Blasters nickname used by the previous VA-34 squadron (the second VA-34). Colors for the insignia are as follows: blue diamond background outlined in black, red stylized wings outlined in blue and white, black and white machine gun in the shape of a cigarette, with a yellow ammunition belt and red bullets, white skull and skeleton with black markings and outline, red teeth, and red markings on the paddles (eyes). 17 Apr 1970: VA-34’s establishment ceremony was conducted at NAS Oceana. 18 SEP 1970: The Squadron boarded Kennedy (CVA 67) and departed on 14 September for final training and an Operational Readiness Inspection prior to its scheduled November deployment to Vietnam. However, while enroute to the Caribbean, the ship was ordered to deploy directly to the Mediterranean after Syria invaded Jordan. Sep 1972: A squadron A-6 Intruder conducted crossdecking operations on HMS Ark Royal while operating in the Norwegian Sea. Oct–Nov 1973: Due to the outbreak of war in the Middle East (Yon Kippur War), VA-34 and Kennedy departed the Norwegian Sea and reentered the Mediterranean, conducting surveillance operations south of Crete. Sep–Oct 1982: During the deployment to the North Atlantic, America (CV 66), with VA-34 embarked, received orders on 22 September to proceed to the Mediterranean due to the continuing crisis in Lebanon. Jan and May 1983: While in the Eastern Mediterranean the squadron conducted air operations from America in support of the multinational peacekeeping forces in Beirut, Lebanon. Sep 1985: While deployed aboard America to the North Atlantic, the squadron conducted flight operations from the carrier while it operated within Vestfjord, a Norwegian fjord. 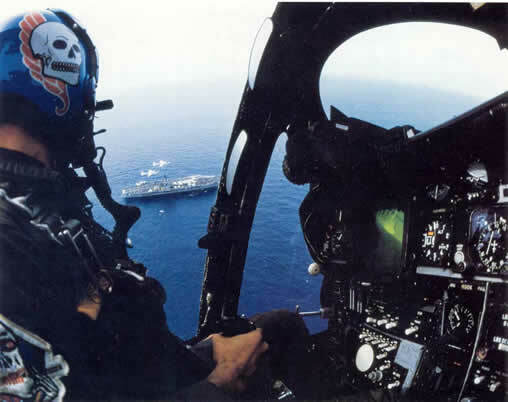 24 Mar 1986: Libyan missiles were fired at U.S. Navy forces operating in the Gulf of Sidra. As a result of this hostile act retaliatory strikes, known as Operation Prairie Fire, were initiated against Libya by the American naval forces in the area. VA-34’s A-6E Intruders, operating from America, attacked and damaged a Libyan Combattante II G-class fast attack missile craft with a Harpoon missile. A follow-up attack by VA-85 aircraft with Rockeye bombs resulted in the sinking of the Combattante II. The Harpoon firing was the first use of this missile in combat and the squadron’s first combat action since its establishment in 1970. 14 Apr 1986: Due to continued Libyan sponsorship of terrorist activity the United States initiated Operation Eldorado Canyon. VA-34 participated in this operation with its A-6Es, conducting a night, low level high speed attack against terrorists targets at the Benina airfield and military barracks in Banghazi, Libya. Aug 1990: The squadron flew missions in support of Operation Desert Shield, the build up of American and Allied forces to counter a threatened invasion of Saudi Arabia by Iraq and as part of an economic blockade of Iraq to force its withdrawal from Kuwait. There have been a total of ?? Commanding Officers of The Blue Blasters as an A-6 squadron. The first was CDR Robert Miles in 1970. The last was CDR Tom Hills.